Hong Kong was one of our improvised stops during our Southeast Asia trip last year. After shortening our time in Southeast Asia to make it to Europe by Christmas, visiting “the city of dreams” before going back to the western world seemed like the perfect plan. 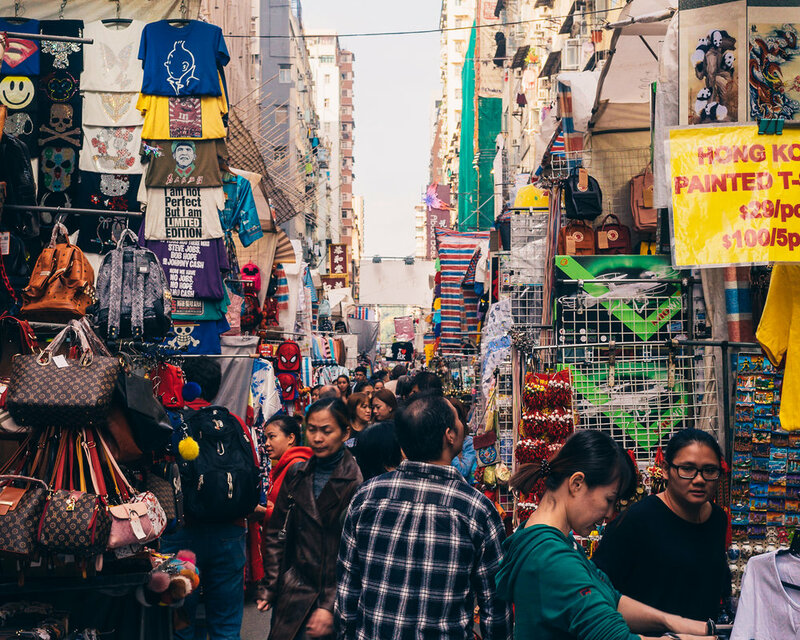 If you’ve ever spent any time budgeting in Southeast Asia, you’ll soon find after landing in Hong Kong that if you do not plan well in advance, you and your bank account will both come to regret it. When visiting Hong Kong, you can decide what kind of experience you’d like to have: fancy restaurants, Disneyland, expensive boat tours, etc. Or if you’re a little like us (which you might be, considering you’ve opened this article), you could choose to explore Hong Kong on a budget. Here’s our list of things to do in Hong Kong on a budget! One of most known viewpoints in all of Hong Kong, and one at which you can spend as little money as you’d like. To start, you can reach the peak by taking the tram for 45 HKD ($5.75), or by trekking up for 45 minutes for free — had I not been on my crutches, this is definitely what we would have done! 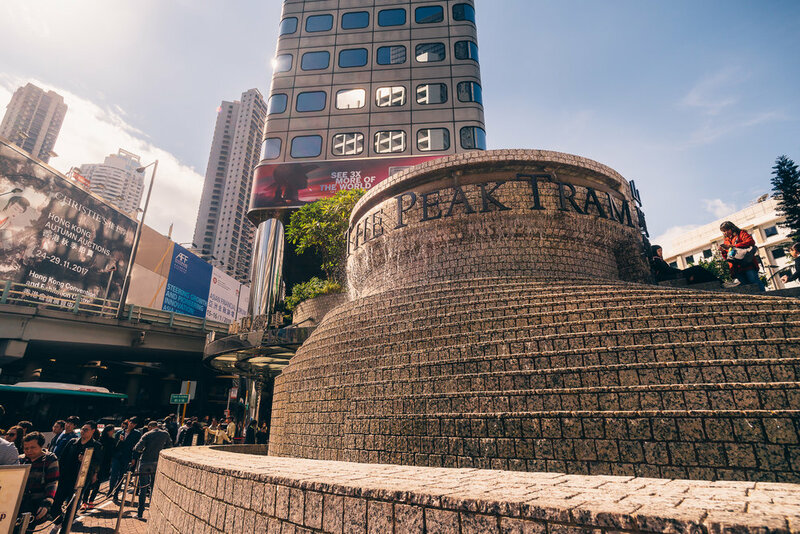 Once you get to the peak, there’s a shopping mall with restaurants and shops in every direction; you can hang around here for free, or simply have a coffee inside with amazing views to soak in. 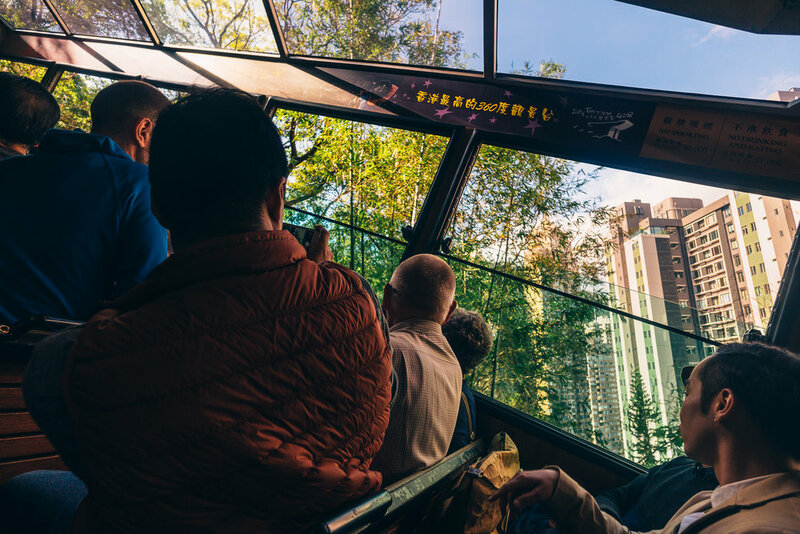 The ultimate experience at Victoria peak is to be had by visiting the “Sky Terrace 428” viewpoint, situated on the highest floor. While this costs 50 HKD ($6.39) to enter, the views from up top are well worth the cost. If you want to work on your bargaining skills, visit the Ladies' Market in Hong Kong. Clothes, shoes, accessories, souvenirs… you can buy all kinds of things in this market for as little as you’re able to bargain them down to! I personally bought boots for the winter, as we’re spending winter in Europe, and I was able to bring them down to half the price they originally asked for! It required me walking away, but I still feel like I would’ve been able bring it down a little further. Tip: Always check whatever you’re buying for imperfections before you leave to make sure you don’t take something damaged home! Going to Hong Kong and not trying Dim Sum should be a sin. We were first-timers and based on some research, we chose to eat at Dim Dim Sum (the one in Wan Chai) because of their good reviews. For those of you who might not know (we didn’t), Dim Sum are small portions of food that are cooked and served in steam baskets, all accompanied by traditional tea. We tried some that were filled with vegetables, BBQ pork, shrimp, and — our favorite — ones filled with yolk custard for dessert. The prices are about $2-$3 per order, so you have to try some at least once on your trip! I would say that this is the Central Park of NY, but in Hong Kong. This massive park has a restaurant, an aviary, an arts center, a museum, and multiple gardens throughout. This is the perfect place to spend a morning or afternoon exploring. To cross from Hong Kong island to Kowloon (or vice versa) by ferry, you’ve got a spectacular budget option, whether it’s Star Ferry Pier -> Wan Chai Pier or in the opposite direction. You’ll get nice views of both skylines, the rides cost only up to 3.40 HKD ($0.43), and the ride will have you on the other side in minutes. 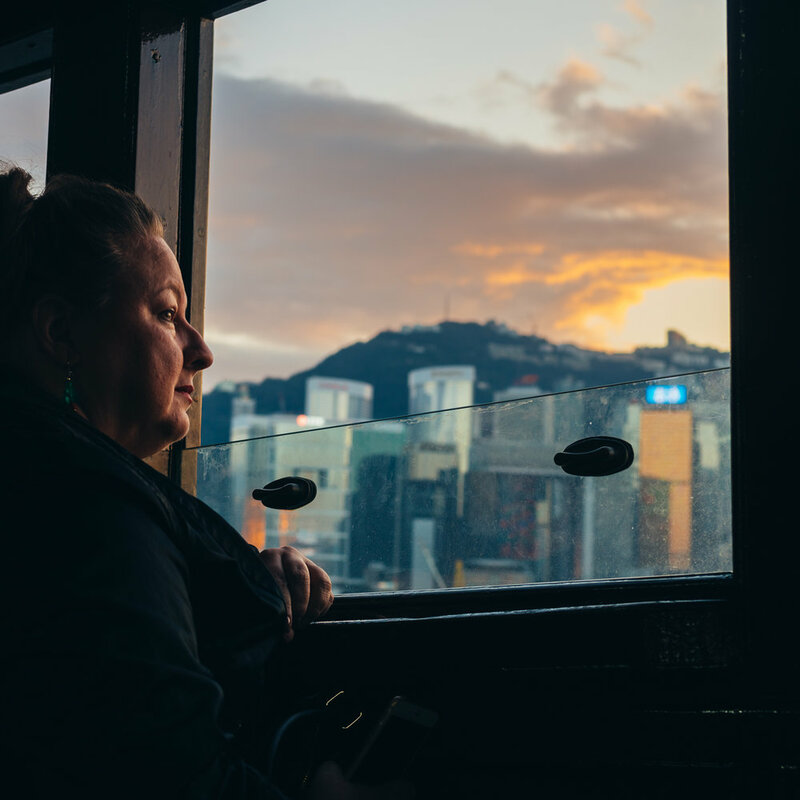 There are two amazing viewpoints from which to enjoy the sunrise in Hong Kong: from Hong Kong island and from the Kowloon peninsula. We loved the views from the top of Wan Chai Pier Station rooftop. There were only a few locals in the entire area, and despite the winter cold, it was an intimate moment we were both able to share in the middle of the busy city. If you have time, visit both sides to admire Hong Kong’s skylines. Another great option would be to take the above-mentioned Victoria Harbour ferry right as the sun begins to set. This is a recognized, charitable temple in the city of Hong Kong where three religions are being worshipped at any time: Buddhism, Taoism, and Confucianism. You’ll find this temple full of worshippers from all over China, burning incenses and praying. For those of you who can’t live without sweets, Hong Kong has their own version of french toast. The main difference is that it is topped-off with condensed milk which makes it extra sweet and if you ask me, perfect. We tried it at a random shopping mall in Kowloon, but you can find them all over the city. This hidden Hong Kong gem is a traditional Chinese garden completely free to visit, inside Kowloon. Within the 35,000 sq. meters that make up the park, you can find traditional architecture, flowers, and plants, free exhibitions, and a vegetarian restaurant. This garden has every detail well-taken care of and will transport you to an older era in Hong Kong. We discovered this place by accident because it is connected to Nan Lian Garden by a bridge. This Buddhist temple charges nothing at the entrance and is surrounded by beautiful gardens and water lilies. It was established as a retreat for Buddhist nuns in 1934 and is a quiet and calm place to escape the busy of the city of Hong Kong. We we’re in Hong Kong during the Christmas season, so while we didn’t get to see the Symphony of Lights, we instead got to watch a special light show they had going on for Christmas. Although Symphony of Lights doesn’t have the best reviews online, I would say that it is worth your time for the price of admission (free). A good viewpoint for watching the show is Tsim Sha Tsui Promenade or Golden Bauhinia Square. Before you go, here are a few more Useful Tips! Best way to move around Hong Kong: Use the (underground) metro! The prices depend on where you are going, but it’s pretty affordable and you avoid traffic. Fares start at 3.50 HKD ($0.45) and you can get an Octopus card for the best rate (link). Cheapest way to get to the city from the airport: Take the bus! When we visited we took the train because it was easier on me and my crutches. But if you want to save some money on your visit to Hong Kong, go for the bus. 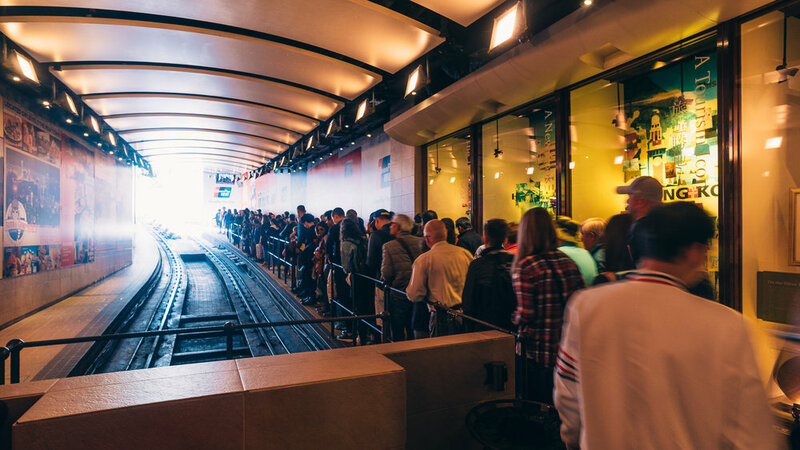 If you’re planning on visiting Victoria Peak and taking the tram up, go early in the morning. We went in the afternoon and the lines to get into the tram were about three hours long. We got lucky because they let me skip the line (finally, something good comes from having to use crutches on our trip! ), but had that not been the case, we definitely would have walked our way up.